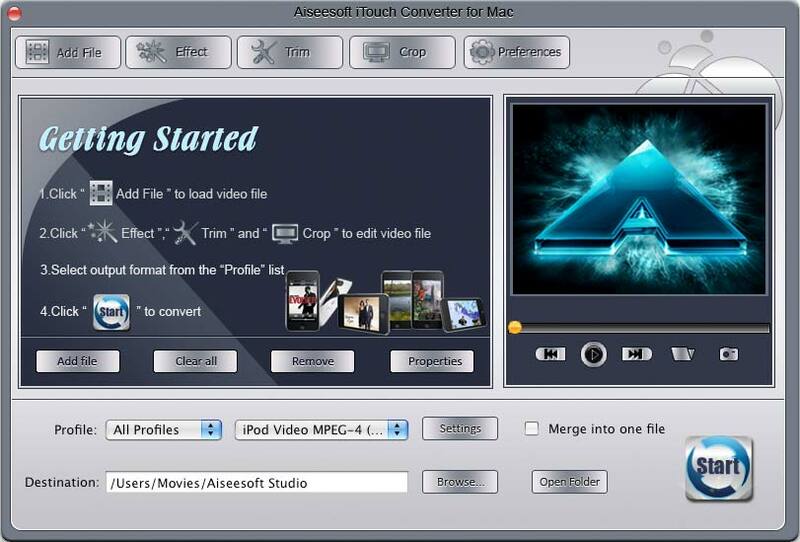 Aiseesoft iTouch Converter for Mac, easy to use Mac iTouch Converter, owns the solution to convert video to iTouch (iPod touch, iPod touch 2) compatible video formats on Mac OS. The powerful input video formats is beyond your imagination, like convert AVCHD (.mts, .m2ts), HD TS, HD MP4, HD RM, HD MOV, and ASF, FLV, WMV, MKV, AVI, 3GP and more. It also can extract audio from video and convert audio to iTouch MP3, AAC, AIFF, M4A, WAV audio. The solution to convert video to iTouch compatible video formats on Mac OS. ...... By using Aiseesoft iTouch Converter for Mac, you are available to convert video to iPod nano, iPod classic, iPod shuffle, even to iPhone. This Mac iTouch Converter also acts as iTouch video editor, since it can convert part of the video to iTouch, crop, merge the video, snapshot, effect and so on. Aiseesoft iTouch Converter for Mac is specially developed for Mac users to put video on iTouch (iPod touch, iPod touch 2). Easy way to convert all popular videos to iTouch MP4, MOV, M4V video, also extract audio from popular videos to MP3, AAC, AIFF, M4A, WAV audio, even the audio to audio conversion. Aiseesoft iTouch Converter for Mac is also used to convert video for iPod nano, iPod classic, iPod shuffle, iPhone. Qweas is providing links to Aiseesoft iTouch Converter for Mac 3.2.08 as a courtesy, and makes no representations regarding Aiseesoft iTouch Converter for Mac or any other applications or any information related thereto. Any questions, complaints or claims regarding this application Aiseesoft iTouch Converter for Mac 3.2.08 must be directed to the appropriate software vendor. You may click the publisher link of Aiseesoft iTouch Converter for Mac on the top of this page to get more details about the vendor.